Polonia Warsaw’s fall from grace is a sad one for anyone involved with the club. These last couple of weeks have been about absence. 10 days ago the new Ekstraklasa season got under way without the Czarne koszule, the draw for the Polish cup included the old, bankrupted Polonia who won’t play in the competition. It’s also been about reminders of what once was: Polonia players are present in almost every squad in the Ekstraklasa. Amongst others Piotr Stokowiec is the new coach at Jagiellonia Białystok and Martin Baran and Miłosz Przybecki have already scored Ekstraklasa goals for their new clubs. But the new Polonia is alive and well. The club, which will start the new season in the Mazovian IV liga North (5th tier), has tried out hundreds of players to add to the graduating class of their youth system. In addition ex-Polonia stalwarts have also offered their services to the club. The most high-profile returnee is 36 year old Polonia cult-hero Jacek Kosmalski who top-scored for the club in the second division in 2006-7. The coaching set-up for the new Polonia is led by two people with strong links to the club. Polonia’s coach is 34 year old Piotr Dziewicki, who won the league with Polonia back in 2000. Assisting Dziewicki is Emil Kot, best known to Polonia fans for choreographing the singing at Konwiktorska, but more recently a coach at lower league Marcovia Marki. Dziewicki and Kot have already led the team out in several friendly matches against sides in the third, fourth and fifth tier in preparation for the start of the season on the weekend of 17-18 August. Often these matches have been organised without announcing the official time of kickoff to avoid the presence of fans of Polonia’s city rivals Legia Warsaw. Mazovian football at a local level is dominated by the presence of Legia. Fans of local teams are often stronger Legia fans than they are of their own club. An example of the kind of welcome Polonia will receive in the Mazovian lower leagues could be seen last Wednesday in a friendly against IV liga PKS Radość. PKS fans are also Legia fans and throughout the game there were chants of ‘Nie ma Polonii’ (Polonia doesn’t exist) and ‘PTSK’ (which roughly translates as Polonia is an old whore – a common chant). PKS fans even burned a Polonia scarf at one point during the match. All of this then is a brave new world for Polonia fans accustomed to being relatively pampered in the Ekstraklasa. 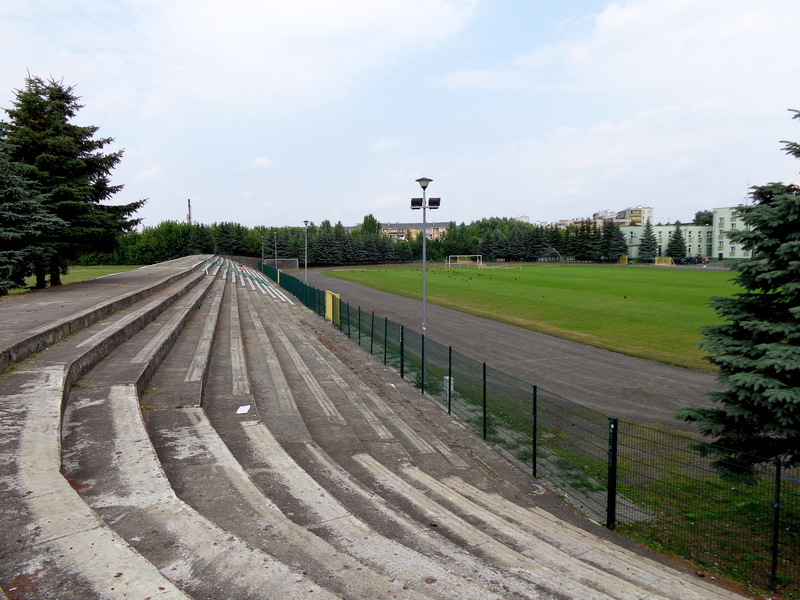 To get a bit closer to what fans of the club might experience, I took a trip on Saturday to one of the clubs that Polonia will play against in the IV liga North. 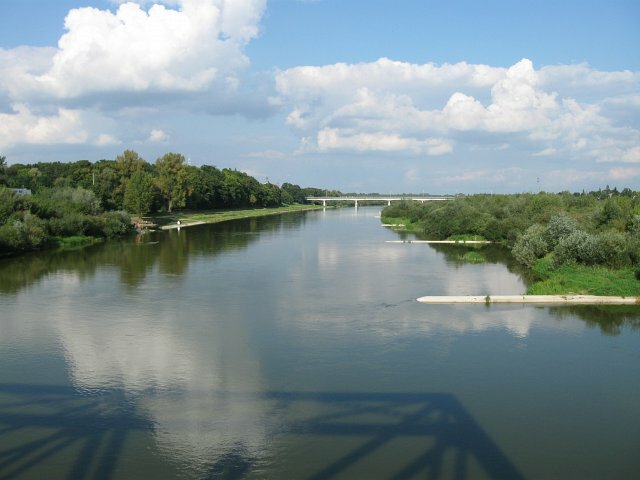 My significant other lives approximately 60 kilometres to the North-East of Warsaw, close to two of the sides Polonia will face in the coming season, Czarni Alkor Trade Węgrów and Bug Wyszków. Time restrictions, and other commitments, meant a visit to only one of them was possible, so we got in the car on a boiling hot day and travelled to Wyszków. Wyszków is a small town in the Mazovian province situated on the banks of the Bug river which winds between Poland, Belarus and Ukraine. The Bug has an important place in Polish history as it was used to mark the new post World War Two border between the three large Slavic countries (although this border is far to the East of Wyszków). The river crossing dominates the town, so it’s no surprise that it is from this waterway that the local football team takes its name. Bug Wyszków were founded in 1922 and have principally existed in the lower reaches of the Polish league pyramid. Their best achievements were achieved in a fifteen year period between 1983-1998 when they played in the third tier of Polish football. In 1993-4 they even competed in the second division but finished in last place and were subsequently relegated. Their lowest point in recent history was in 2001-2 when they dropped to the 8th tier of Polish football. Since then they have steadily made their way up through the league system to the fifth tier. In the last four years they have consistently challenged for promotion to the Mazovian-Łódź III liga. This suggests that Bug will be one of the main challengers to the new Polonia in 2013-4. The first thing you notice on making your way to the ground is the triumphal arch which marks its entrance. For a stadium in a relatively small town it makes quite an impressive sight. 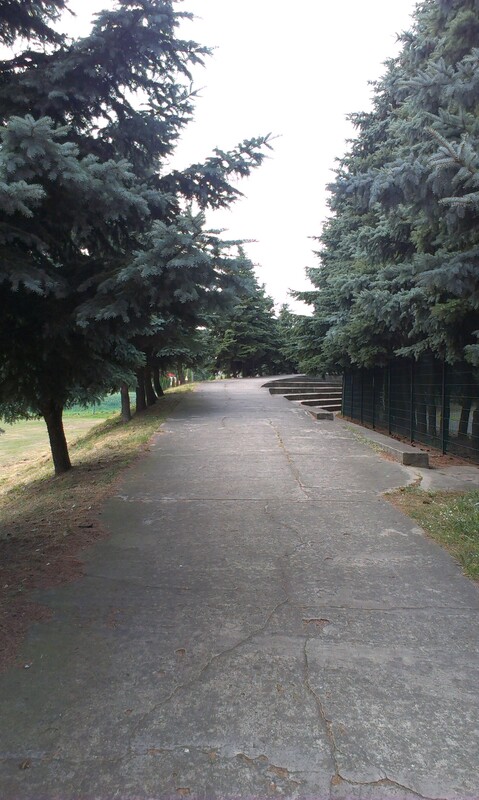 As you enter the stadium you walk along a path lined by trees which offers a pleasant spot of shade on a hot, summer day. As to the stadium itself, it’s basically a large cement bowl which surrounds a well-tended pitch. 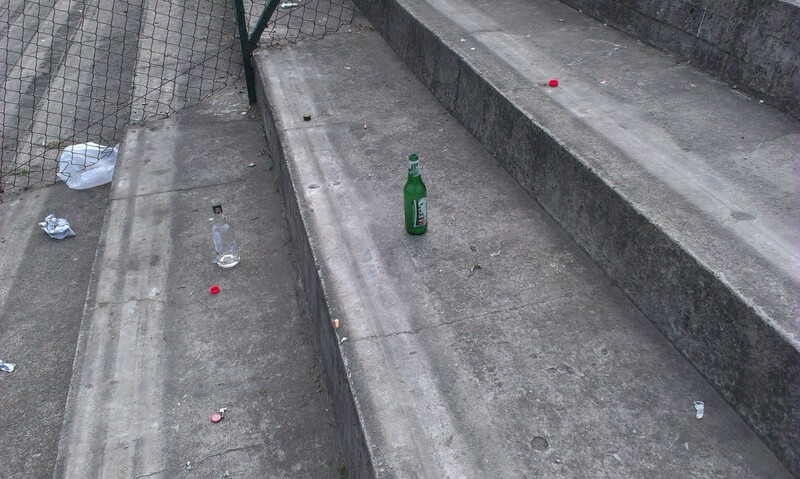 Several teenagers were sitting in the stands, obviously not that much to do on a Saturday afternoon in the town! 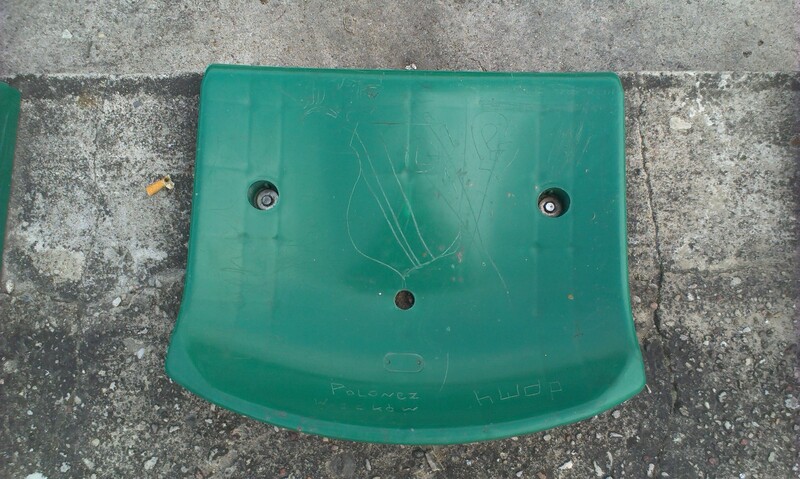 What was also noticeable was the Legia paraphernalia dotted about the place. 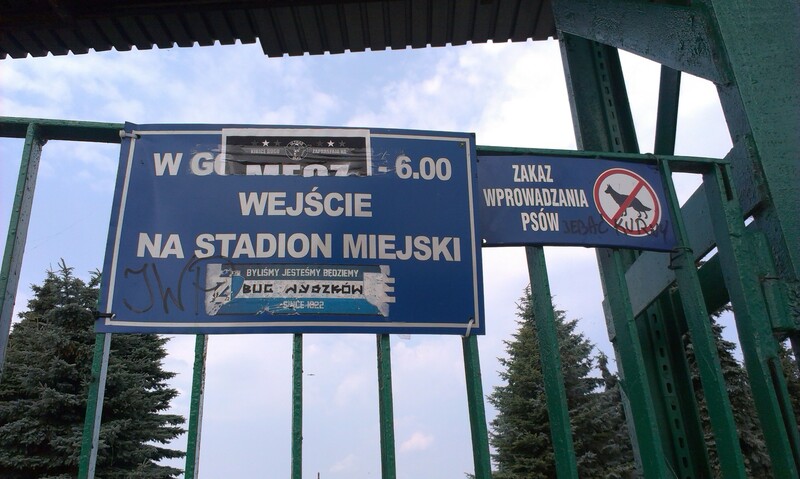 Bug Wyszków fans are also pretty big supporters of Polonia’s city rivals, so a visit here for the Czarne koszule could be quite daunting. On the whole the stadium was in quite good condition, and I’m sure Polonia will play at places with much worse facilities over the coming season. I’ll do my best to get to more of the grounds in which Polonia will be playing over the coming months. This is rightbankwarsaw signing off. 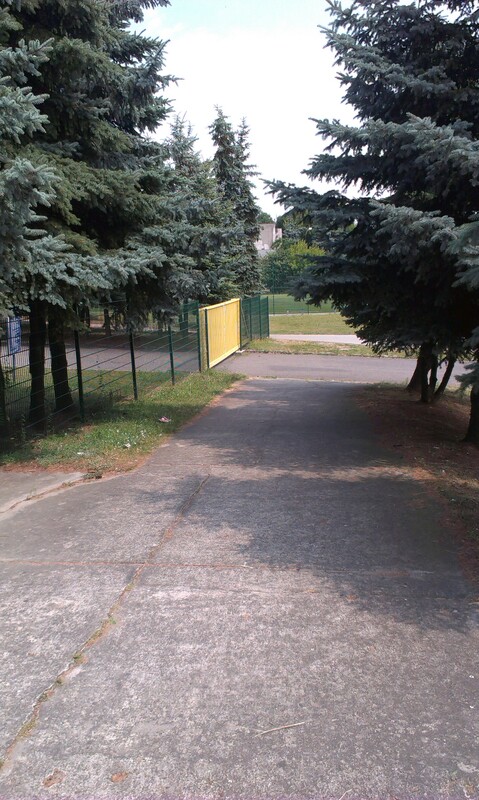 This entry was posted in Uncategorized and tagged Bug river, Bug Wyszków, Czarni Węgrów, Emil Kot, Groundhopping, IV liga North, Jacek Kosmalski, Mazovia, Piotr Dziewicki, Polish football, Polonia Warsaw, Warsaw, Wyszków. Bookmark the permalink. Thanks man! Will you be heading to any away games this year?